Home Asset declarations a myth? That there are very few role models in our public life is self-evident. The material poverty of the country is reflected in the poverty of its leadership, in as much as our twisted concepts of governance echo in the shoddiness of its delivery. So disillusioned are the people with the national leadership that whatever is said or done by a politician is examined only for its hidden motives; the man’s subjective political interests, the benefits to his family and associates, and the money made under the table. The public is justified in their scepticism, they have observed the rapid enrichment of these “servants of the people”, and of course, the gentrifying of the family of the “leader”. 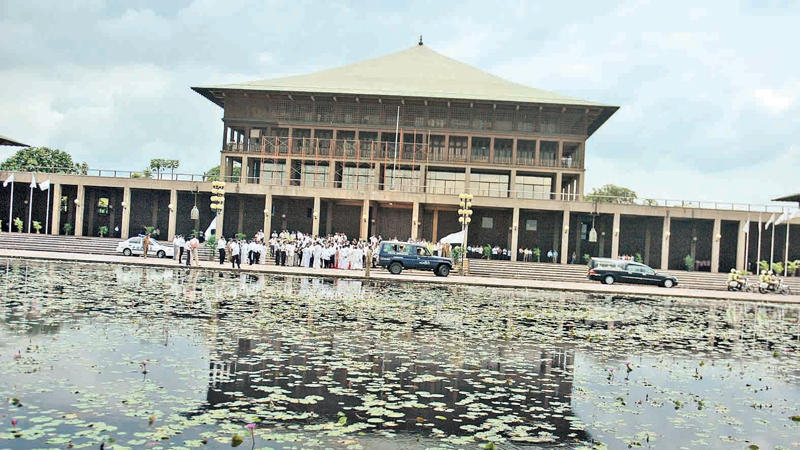 In Sri Lanka, politics is the easiest path to elite status. Turning the meaning of public life upside down, those who clamour to serve the people, are served best; all it takes is just one term in public office to become wealthy and “respectable”. Typically, the ‘servant of the people’ ends up owning a couple of houses in Colombo, a business, maybe a tourist hotel, and perhaps educate his children in a Western country. In the “leaders” who had such a head-start, there will be no noticeable change in their life style in the mother country. They will eat the same way, dress the same way and continue doing the same things. Their plunder will be carefully hidden; mainly overseas, in tax heavens, reliably managed by others. There is comfort in knowing that when the need arises, they could access anything that the wealthy in the rich countries may command; health care, travel and other luxuries. We are not suggesting that only those who are good at wealth accumulation should count. Invariably, huge amounts of unexplained money, suggests dishonesty and corruption of the soul. But that does not mean that the opposite, a person with no wealth at all, is necessarily a good leader. A persons’ pre-leadership years should carry some promise; attitude, creativity or skill. Leadership is a complex phenomenon; every culture has distinct concepts of leadership. A Gandhi would not have succeeded in China, while a Mao would be a misfit in India. We too have a concept of leadership. The past seventy years have shown the flaws of that leadership model. Coming back to the assets/liabilities, obviously, the main purpose behind the declaration is to keep the declarant on the straight and narrow. It is assumed that the first asset declaration would act as a base to monitor the subsequent asset betterment of the declarant. For good measure, he is also expected to provide details of the assets/bank accounts of his spouse and dependent children under the age of eighteen. After taking up public office, if the declarants’ asset position improves far beyond what could be explained with his income, something is wrong clearly. This easy scenario is based on there being an accurate first declaration, and that he continues faithfully to submit honest annual returns thereafter. But we know that a dishonest public figure is not going to cooperate in his own destruction. It is not imperative to transfer “black” assets to his nuclear family, when there is an extended family who could be largely relied on to collaborate, the space to manoeuvre is much larger. As recent events have shown, there are plenty of willing non-dependent children, siblings, cousins, aunts, uncles and in-laws out there. The scandal over the so called Panama Papers and the law firm Mossack Fonseca illustrated the global nature of the black money industry. With complex company structures spreading through several countries and the collusion of sophisticated accountants, bankers and lawyers, hiding ill-gotten money has become a global industry. Even little Sri Lanka had a few names among the Panama Papers rogues’ gallery; small economies like ours are exposed to easy milking by the unscrupulous. For failing to submit the asset declaration, there is a small fine/custodial sentence prescribed. In the larger scheme of things, it is difficult to envisage a jail terms for the non-submission of a statement. The asset declaration is only the starting point. To have any meaning, it needs to be audited vigorously. A person could well submit a declaration having transferred his assets to another, for ‘safekeeping’. Investigating hidden assets is a painstaking, as well as a time consuming task. If the declarant is a taxpayer, his tax file and other records should be compared with the asset declaration. Then, there are major expenses that call for explanation; overseas travel, educating the children, medical visits. These overseas indulgences are way beyond what the salary of a member of parliament could meet. It is more than likely that some of our public figures maintain bank accounts plus assets in foreign countries. It is rumoured that large liabilities like loans/mortgages of certain public officials have vanished overnight. Here again, explanation is required. Who paid the debts off? It is widely accepted that we, haven either the laws, nor the dedicated organisation to take on corruption; a plague, which besides being deeply entrenched, is near systemic now. While the taker (of bribes) must be stopped, for the giver, the consequences must be prohibitive. The scope and complexity of the challenge calls for sweeping laws, special courts and high calibre investigators. In a country habitually falling short, such expectations are bordering on the fantasy. As a people, we gain satisfaction in announcing the journey, not taking the journey. There will be endless talk about corruption, but we will not walk the talk; the path is too hard, there are too many obstacles and there is comfort in doing nothing. If we were to go by the asset declarations, our public affairs are in the hands of self-denying ascetics, their asset base painfully modest. But their lives, particularly of their children; pleasure seekers, daredevils, gourmets and sometimes students at foreign universities; give the lie to what the father solemnly professes. In a material sense, the entire family “is made”, they have arrived.